Many facilities have chosen reclaim feeders and conveyor equipment from Joy Global for their materials handling. Joy reclaim feeders are not new to the materials handling industry. Joy Global, through its acquisition of Stamler Corporation, has been producing reclaim feeders for over 25 years and has manufactured over 430 units operating in a variety of applications worldwide. In 2008, Joy Global also acquired Continental Conveyor, a manufacturer of reliable conveyor components and systems, to provide a one- source solution to ports and other coal handling facilities for their materials handling needs. US coal exports reached record levels in 2012. Many new and expanding facilities were located along the US Gulf Coast. Many new and existing facilities looking to improve material handling and/or upgrade their operations along the US Gulf coast have chosen the combination of Joy reclaim feeders and Joy conveyor equipment. Mississippi: 2 reclaim feeders handling petcoke. o redundancy for maximum system availability: multiple reclaim feeders can also feed a single conveyor system to increase overall capacity. Reclaim feeders are typically limited to around 4,000tph (tonnes per hour). Conveyors can be designed to receive and transport tonnage rates in excess of maximum reclaim feeder capacity. Planning for the maximum capacity for a conveyor system is a key component to having flexibility in tonnage rates. CHOOSING QUALITY CONVEYOR COMPONENTS When moving materials, time is money. That is certainly true when loading ships in port facilities. Proper selection of quality equipment is a key component to long-term conveyor availability. In the US, CEMA (Conveyor Equipment Manufacturers Association) sets the standards for conveyor idlers. Facilities should anticipate the peak handling tonnage and design the system accordingly. Conveyors are one of the most cost-effective methods of moving bulk materials and can provide efficient and reliable service for many years. Some facilities utilize multiple reclaim feeders to add materials to the conveyor system. This can be done to increase tonnage, or to blend a variety of materials that are stored in separate stockpiles in the same yard. Additional feeder-breakers can be added later to feed the conveyor system. Facilities should consider the potential for increased loading when selecting conveyor components. Coast. Proper equipment selection based on expected peak tonnage and the selection of quality reclaim feeders and conveyor equipment are key components to long-term system success. Port Corpus Christi has been generating business and jobs in South Texas for 87 years. Strategically located on the western Gulf of Mexico, Port Corpus Christi is the fifth-largest port in the United States in total tonnage. The port provides a straight, 45ft-deep channel and quick access to the Gulf of Mexico and the entire United States inland waterway system. The port delivers outstanding access to overland transportation, with on-site and direct connections to three Class-I railroads, BNSF, KCS and UP, and direct, vessel-to- rail discharge capabilities through Corpus Christi Rail Terminal. The Joe Fulton International Trade Corridor, now fully operational, provides direct, non-congested access to Interstate 37 and Highway 181. Port Corpus Christi is ideally positioned for Global Trade in the South Texas Region. March 2014. The port is moving forward with the development of the La Quinta Trade Gateway, an 1,100-acre greenfield site designed to accommodate a multi-purpose dock and container facility. Recognizing the growth of breakbulk and project cargoes, the port identified the necessity to improve rail capabilities and has embarked on a $20 million rail improvement project. The engineering design for the construction of a new rail yard adjacent to the Viola Turning Basin to better serve its customers is in progress. All these efforts open the gate for an increase in trade for the South Texas Region. As a leader in environmental awareness, Port Corpus Christi adopted an environmental management system (EMS) in 2004. This EMS is ISO 14001 certified and initiatives include an anti- idling campaign, a port-wide recycling programme, and an annual Gulf Ports Environmental Summit to share ideas on common environmental issues faced by all Gulf Ports. The port offers more than 125 acres of open storage and fabrication sites, heavy lift capabilities, more than 295,000ft2 of covered dockside storage as well as a cold storage facility. Port Corpus Christi operates Foreign Trade Zone (FTZ) #122, reorganized under the Alternative Site Framework (ASF) for greater flexibility and expedited access to FTZ benefits. Coal, ore, minerals and other dry bulk commodities can be discharged directly from vessels to railcars or trucks at Bulk Dock #1. This facility can also be used to load vessels when special handling is required. Bulk Dock #1, which is operated by the Port of Corpus Christi Authority, is located at the Bulk Terminal, on the north side of Tule Lake Channel in the Inner Harbor. Road access is via Navigation Boulevard. Rail service is provided by the Burlington Northern Santa Fe Railway,Tex-Mex Railway Co. and Union Pacific Railroad through the Corpus Christi Terminal Railroad, Inc. (CCTR). A certified rail track scale is located convenient to the Bulk Terminal for accurate weighing of railcars. Vertical clearance From bottom of bucket to water line at MHT 60ft for either 10 or 15 cubic yard bucket Panamax class vessels are handled at this facility. Stevedores can offer advice on handling vessels exceeding 700 feet in length and/or exceeding 34 feet draught. Cargo handling The travelling unloading tower has a free digging rate of 600 short tons per hour using a 15 cubic yard bucket to discharge products weighing 55 pounds per cubic foot. Actual productivity varies depending on the product and type of operation. Coal, petroleum coke, and other dry bulk commodities can be loaded directly to vessels from bottom dump railcars, dump trucks or storage at Bulk Dock #2. Location and access Bulk Dock #2, which is operated by the Port of Corpus Christi Authority, is located at the Bulk Terminal on the north side of the Tule Lake Channel in the Inner Harbor. Road access is via Navigation Boulevard. Rail service is provided by the Burlington Northern Santa Fe Railway,Tex-Mex Railway Co. and Union Pacific Railroad through the Corpus Christi Terminal Railroad, Inc. (CCTR). A certified rail track scale is located convenient to the Bulk Terminal for accurate weighing of railcars. Aerial clearance From bottom of spout to waterline at MHW: 62ft Panamax class vessels are handled at this facility. Vessels over 850 feet length overall must be shifted to permit full access by the loader. Cargo handling The radial shiploader is capable of loading products weighing 55 pounds per cubic foot at a maximum rate of 1,500 tons per hour. Actual productivity will vary depending on the product and vessel. Quotations and arrangements for loading vessels at this facility can be obtained from the local stevedores. As part of its ongoing plan of fleet standardization, Associated Terminals christened its eighth crane from Gottwald Port Technology of Düsseldorf, Germany. On 3 October last year, Associated Terminals christened the derrick barge T. May, a 8400B model. The christening took place at Woldenberg Park on the Mississippi River in New Orleans, Louisiana. The T. May is the eighth Gottwald crane in the Associated Terminals fleet. This marks the fifth year in a row that Associated has added new equipment to its fleet of stevedoring cranes. The Gottwald 8400B crane is mounted on a heavy load deck barge built by Conrad Industries of Morgan City, LA. The barge measures 250 × 72 × 12 feet. The crane was named after Terry May, Senior Vice President of Associated Terminals. May has 35 years in the maritime industry. In his speech, May thanked the individuals who influenced his career at the companies where he has worked as well as his Associated Terminals teammates. In addition, he thanked his parents, wife and daughters for their support. May started in the maritime transportation industry in 1978 with Ingram Barge Company as a dispatcher and ultimately advanced to Bulk Sales Manager prior to his departure in 1986. Before rejoining the Associated team in 2003, he had numerous years of service with Consolidated Grain and Barge, International Marine Terminal, The Valley Line Company,The Port of Mobile, East/West Marine Terminal, and Celtic Marine. He has been with Associated Terminals for a total of 13 years asVice President and currently serves as Senio Vice President. He also serves on the board of the Mississippi Valley Trade and Transport Council. Located at the foot of the Mississippi River Bridge in Port Allen, Louisiana, Associated Terminals of Baton Rouge is firing on all cylinders. This prime location on the Intracoastal Canal serves as a logistical hub for the movement of commodities such as rice, fertilizer, grain and other goods where barge and truck is key. Construction is complete on a new 17,500 square foot warehouse. The new warehouse will be primarily utilized for the storage of urea. A phased dock expansion is also underway at the property. Phase I of the renovation is a new dock measuring 60’ x 130’. The expansion will ultimately result in a 400ft linear waterfront. The increase in surface area is needed to accommodate the increased number of trucks that will be visiting the facility due to long-term contracts that will provide a steady stream of additional products into the facility. From an equipment standpoint, a Hyundai L800 excavation and an additional Hyundai 740-9 wheel loader will be in put in service this year. New marine radios have been installed to increase communication between the scale master, the fleeting boats and the truck drivers increasing the operational and safety integrity of the location. In April last year, the Port of South Louisiana dedicated its new finger pier, and also held a grand opening of its Maritime Security Operations Center (MSOC) at the Globalplex Intermodal Terminal. Louisiana Department of Transportation and Development’s (LA DOTD) Secretary Sherri LeBas joined Port of South Louisiana (PSL) Executive Director Joel T. Chaisson and Commission President P. Joey Murray III at a dedication for the new Finger Pier at Globalplex Intermodal Terminal during a ceremony held on 9 April 2013. 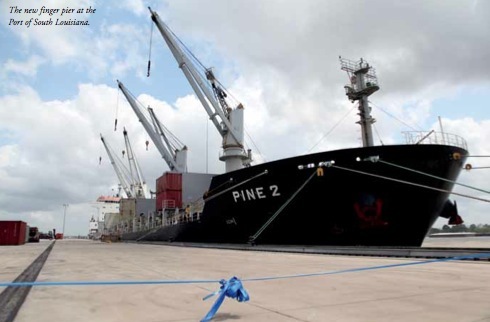 The $19.5 million project, an extension of the general cargo dock, was funded in part through the Louisiana Department of Transportation and Development’s Port Construction and Development Priority Program in the amount of $15 million. Built by Continental Construction Company, the Finger Pier adjacent to and downstream from the general cargo dock, is a 700ft long and 65ft wide extension that can facilitate berths of additional vessels at Globalplex. It enables barges to moor on the inboard side as well as both vessels and barges on the outboard side, improving efficiency of ship-to-barge and truck- to-barge operations by allowing simultaneous operations on both sides of the Finger Pier. Estimates of approximately 47 new vessel calls per year are expected and increasing by 70 vessels by the second year of operation. The project also included the demolition and reconstruction of the downriver mooring dolphin. Commission President P. Joey Murray acknowledged the current commission board members (Raymond Fryoux, Louis A.
Joseph, Joseph Scontrino, Robert ‘Poncho’ Roussel, Paul Robichaux, and Stanley Bazile) and former port commissioners (Sheila Bonnette, Russell Gaudet, Blaise Gravois, the late Gregory Gravois, and the late Lawrence Jackson) who were involved in the planning stages of this project. Following the Finger Pier dedication, the Port of South Louisiana held a ribbon cutting for the new Maritime Security Operations Center (MSOC), also located within Globalplex Intermodal Terminal. Established as a command and control centre to manage emergencies within the Port of South Louisiana’s jurisdiction, the MSOC is a 2,000ft2 hardened concrete and steel building with impact-resistant glass, built to withstand 150 mile-per-hour winds. Equipped with the latest in communications and surveillance equipment, it is linked to MSOCs at four other deep-water ports on the lower Mississippi River, as well as federal, state, and local emergency response agencies. The $1.2 million project was funded in part by $965,000 in grants from the US Department of Homeland Security. Louisiana’s Department of Transportation and Development provided funding for the remainder. The establishment of MSOCs at the five lower Mississippi River deep-water ports is a network system that gives full maritime domain awareness over the Mississippi River, something Captain Peter Gautier of the US Coast Guard New Orleans Sector lauded during a speech at the event. “We have a linked system of communications for the first time, together with sensors that can tell us very early on if we are having an incident on the river,” said Captain Gautier. “Really what it does is it ups our game in terms of responding faster and better to maritime incidents and to protect the people and the property and the environment of this most important river and in this economically-vibrant region.” He went on to say that “...when you think in terms of maritime security in the modern sense, it’s hard not to think of September 11, 2001. And, in that sense, it’s designed to confront new threats presented by a new adversary and one that seeks to exploit our weaknesses and the gaps and seams. And the main gap and seam we have is the maritime environment. This seeks to close that gap and seam. Oldendorff and United Bulk Terminals have introduced a demurrage-free top-off service for Capesize vessels from the US Gulf to India and Far East. In November last year, United Bulk Terminals USA Inc. and Oldendorff Carriers GmbH & Co. KG announced their co-operation to market combined loading and shipping of coal and petroleum coke in Capesize vessels from the US Gulf Coast to India and East Asia. The new service includes United Bulk Terminals export terminal in Davant, Louisiana and Oldendorff’s top-off installation in Trinidad. For the first time customers are able to book fully loaded Capesize vessels from the US Gulf Coast at a very competitive fixed rate, face no demurrage risk and receive high quality professional service from two market leaders. Customers will be quoted one competitive and all- inclusive freight rate for loading of a Capesize vessel up to maximum available draught (approximately 47ft/120,000dwt) and a smaller shuttle vessel of approximately 50dwt to 60,000dwt. Both vessels will sail to Trinidad where the cargo of the shuttle vessel is consequently transferred into the Capesize vessel at Oldendorff’s existing top-off installation. The contract eliminates any demurrage risk for the customers at United Bulk Terminals Davant and Trinidad. “We are very excited about the opportunity to offer this unique service package together with Oldendorff, the world’s largest dry bulk carrier owner/operator. Our ongoing expansion project at Davant, where we are currently doubling our handling capacity to over 20mt [million tonnes] per year, will enable us to offer our customers the best possible transshipment and freight terms for coal and petroleum coke exports to Asia” says Jan Vogel, president & CEO of United Bulk Terminals. “Our worldwide fleet of over 450 vessels and the existing top-off operation in Trinidad are now complemented by a high performing loading facility with approximately 4mt of ground storage and strong ties to river transportation” adds Patrick Hutchins, managing director of Oldendorff Carriers London. ''The Trinidad project in the Gulf of Paria has been in operation since July 2012 and transshipped more than 2mt of iron ore in the first four months of operation''. Both companies believe the combination of two successful and established operations will form very competitive and simple alternatives for producers, trading houses and importers alike. Because no new investments are required, the service is available with immediate effect and with no long-term commitment required from the customers.